Site revenue depends on many parameters: the page content of your site or searches entered by users, position and format of ad blocks, number of advertisers and their CPC. For this reason, Yandex cannot guarantee a specific revenue for a site. There are several main factors that can influence the revenue of your site. Time targeting. Advertisers can assign various temporary targeting parameters for their ads. For example, they could decide not to display ads at night or during certain days of the week (for example, on weekends). This could change the number of ads selected for impressions and, as a result, lead to changes in the CPC and CTR of displayed ads. Geography. Many advertisers target their ad platforms toward people who live in certain areas, so revenue is also influenced by the geographical location of site users. If your site has a large percentage of foreign users or users from regions of Russia and CIS countries with a small number of advertisers, your site could possibly display less ads or perhaps none at all. In this case, in order to maximize your revenue you can automatically display your own ad or an alternative (for Direct or RTB ad blocks). Time of day and day of the week. Please note that the number of users of your site is also susceptible to changes depending on the time of day and day of the week. The number of users increases during working days and business hours and drops during weekends, days before holidays and during holidays. In addition, Yandex is constantly working to improve its ad selection algorithms and strives to make ad products more effective and increase its partners' revenues. Modifications to algorithms could be accompanied by insignificant fluctuations in site revenue. The seasonality of certain products could significantly affect the revenue of sites where such products are advertised. 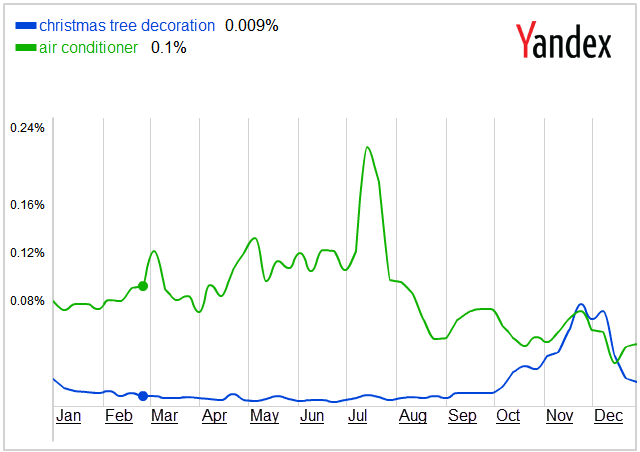 Using the Keyword Statistics service, you can view graphs on internet users' spike in interest in Christmas toys and air conditioners (for example, enter the query “air conditioners” and select the display view for query history). Blog owners also experience similar peaks in interest. Even if a site's audience size is not susceptible to seasonal fluctuations and the interests of its audience remain constant, you could still begin to show content-based ads that advertise seasonal products, for example, right before gender-based holidays like International Woman's Day or Father's Day. This could lead to an increased CTR and price-per-click on your site and, as a result, increased revenue. Also during the long Christmas/New Year and May holiday seasons, when the total number of internet users decreases, prices-per-click can significantly drop. During this period, many advertisers disable their ad platforms, which leads to a temporary drop in revenue for your ad platforms.